Sailboat designs and plans for an offshore capable cruising boat with shallow draft. The program of this boat is offshore cruising with comfortable accommodations for 2 during long cruises, maximum 5 during shorter cruises. 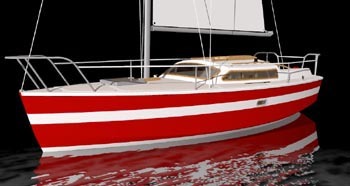 See cruising sailboat plans below. Please call us at 772-770-1225 for MarinEpoxy or SilverTip Kit Pricing. These kits may require freight shipment quotes.